Happy Thanksgiving everyone!!! Hope you are enjoying this special day with loved ones! I’m so thankful for all of you for reading and for all of your encouragement in the Comments section. I feel less far away from you all through the blog:-) Enjoy your turkey and pumpkin pie!!! On the left: The teachers from my school’s English department gave me this cake today! Such a sweet recognition of my being away from home on a holiday. 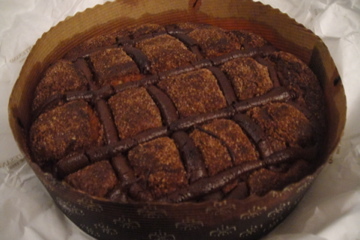 It looks like a chocolate-chip cake inside-we haven’t tasted it yet, so the full report is to come. On the right: I was excited to find pecan pie here! 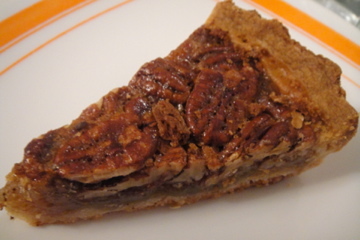 However, I’m not so excited that it has come from the Starbucks pastry case, labeled as “Cake of Pecans.” Again, the full report to come- I’m not getting my hopes up too high for this one! We missed you too but there is always Feliz Navidad!